½-¾ cup slivered almonds – optional. I normally just eyeball it. I never measure this as its as per your own preferance and taste. Pre-heat the oven to 325ºF. Grease a pan generously with spray and cook or something similar. This time I decided to bake it in a ringpan – just to be different. It’s easy to slice and you will have more manageable portions. If you do not have overripe bananas, nuked the bananas in the microwave for approximately 40 seconds, this helps to soften them. In a separate bowl cream (with an electric hand mixer)the margarine, sugar, egg and vanilla till light in texture and it has a nice pale color. Add the mashed bananas. Beat again and mix thoroughly. Add self-raising flour and salt. Now use a spoon and mix it till no flour visible. 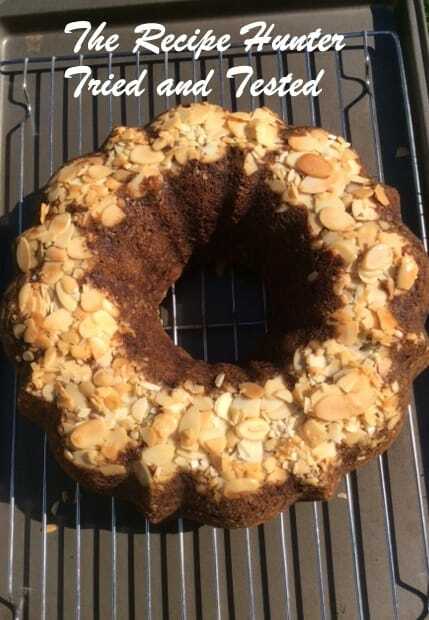 Should you use a ringpan, then you need to place the almonds on the bottom with the batter on top.